Artwork photos are linked to the pages in the Photo Tour, with more information. Chrissie Iles: There is a kind of magic in “Living Structures”; the exhibition unfolds exactly as your opening curatorial statement describes: as a plural experience: aesthetic, sensory, intellectual, emotional, affective, psychological, political, sociological, anthropological. The places in which we encounter the work – convents, schools, private colonial houses, small museums of medicine, ethnography, archeology, a government building, a sanatorium, many with gardens, courtyards, and contemplative spaces – are not dominated by the over-determining presence of the museum as an institution of cultural power. Your sensitivity in choosing artists and works that resonate in and with these spaces, and in bringing together six parallel shows that underline this exploration of art as experience, has created a powerful and important show. Do you think it is possible to create this kind of experience in a sustained way, as an alternative model for exhibition making, or is its magic dependent on the ephemeral nature of the Biennial and the specific vision you had for this show? Jesús Fuenmayor: I appreciate how your question evinces an acute and sensitive recognition of the considerations that guided my development of the curatorial proposal for the XIV edition of the Cuenca Biennial. Is it possible to turn my curatorial project into a sustained alternative model? Yes and no. Let me explain. I do not have a formula, but I do follow certain principles in my curatorial practice. I always try to build sensible bridges between artworks and the public, a curatorial philosophy discredited by curators focused on marketing and by the corporatism of museum institutions that destroy the artistic experience in the name of a didactic mission (neo-colonialist) and by other distortions that have taken priority like increasing the number of visitors. I always try to work side-by-side with artists and start a dialogue with them. I always try to privilege reflexive works that take into account the spatialities and temporalities specific to each situation. I work from the beginning to end: from the moment in which the work is being conceived until the moment in which the work is exhibited and begins its journey through all of the possible dialogues and interpellations that occur through its public life. I have deep respect for the conceptual and professional rigor of artists and for their ethical and political commitments. But each project is different, as different as the memory and character of each place and moment. I like to think that if exhibitions of contemporary art were designed according to the experiences they produce (instead of popularity or prestige) they would be much more effective in establishing productive relationships. But exhibitions depend on many factors external to their curatorship. If this edition of the Cuenca Biennial serves to think beyond the demands of marketing, didacticism and advertising—and beyond personal agendas that generate an impoverishment of the works’ experience—then I would feel more than satisfied. It is not easy to deal with all the distractions that revolve around an exhibition, but when the artists have the intelligence, willingness and courage, it is worth it. I feel very fortunate to have had the artists’ support and enthusiasm to realize their projects and maintain a productive dialogue at the time of their work’s reception, which is the main purpose of my proposal. I just hope to keep working in this way. Chrissie Iles: The works in “Living Structures” articulate many ideas particular to Latin American notions of time, space, ecosystems, the built environment, social space, education, history, cosmology, indigeneity, language, culture, and politics. The predominance of these ideas in a show of mainly Latin American artists within a structure that has not been co-opted by the hyper-Capitalist, market-driven atmosphere of the art world that now dominates America and many parts of Europe is deeply important. Do you think that the character and history of Cuenca and Ecuador gives the Cuenca Biennial a unique and newly urgent role in Latin America and the world beyond, as a forum for Latin American artists and curators to create new cultural models? Jesús Fuenmayor: Asking the Cuenca Biennial to assume the role of a Latin American forum would be a very interesting, necessary project and a great challenge; but, on the other hand, it would go somewhat against the spirit of its history and reality if it were posed as an urgency. 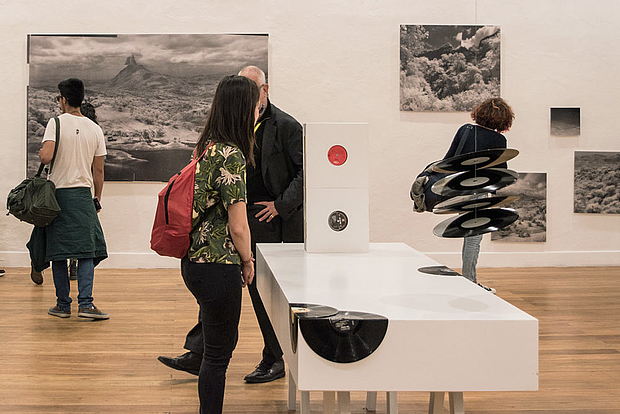 The great achievement of the Cuenca Biennial is its sustainability and sustained growth, which has allowed it to gain recognition and international visibility. This is undoubtedly related to its character and particular history. 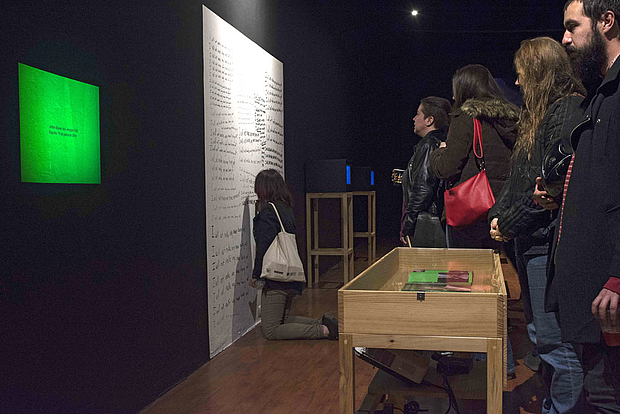 The reasons why the Cuenca Biennial manages to endure in a Latin American context, where most biennials die, are many. The most obvious is, above all, UNESCO’s declaration of the city as a historical heritage site (1999), which created the conditions for making citizens aware of the urban environment’s historical relevance and thereby provided a relevance to cultural life. I also believe that Cuenca’s desire to position itself as a city with an independent character and physiognomy vis-à-vis Quito (the administrative capital) and Guayaquil (the economic capital) has driven its promotion as the cultural capital of Ecuador, thanks to which the Mayor’s Office guarantees the resources for sustaining cultural events like the Biennial. The scale of the Biennial also contributes to the fact that, with relatively limited resources, it can be carried out and have a strong impact in an urban context defined by a colonial fabric, which is openly available to the city’s inhabitants and visitors. This culture of openness to visitors plays a very important role in the Biennial’s success and its positive reception among the Cuencans, who outwardly live their history. The fact that the Biennial can expand throughout the historic city and its surroundings is a great temptation for many contemporary artists who seek alternatives to art’s conventional spaces. The Biennial’s other important achievement has been to know how to evolve at its own pace, generating sustained growth. The Biennial has gone through several stages. From a Biennial focused on painting and organized by national representations since its inception in 1987 up until 2002, in 2004 it became a Biennial organized by several curators with thematic exhibitions (without national representations) and incorporating all media. 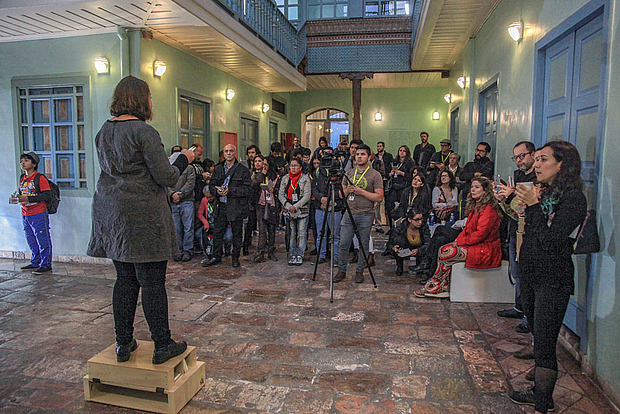 For the last three editions, the Biennial has implemented an organization under a general curatorship, which has contributed to the Biennial having much more cohesion and which can promote an overall vision for a mass audience—the reason for being and existing as well as the great challenge of Biennials. 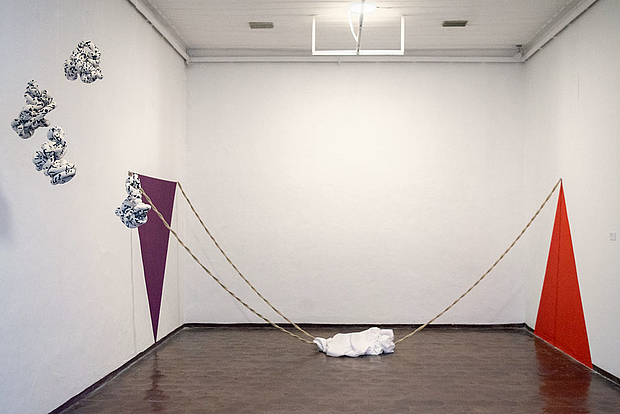 I believe that the slow and silent evolution of the Cuenca Biennial has favored its durability. That Cuenca continues with a stubborn and deliberate tenacity is what makes it unique and admirably enduring. Making the Cuenca Biennial a Latin American forum for creating new models to exhibit contemporary art is a project that I would agree with as long as it is done thinking in the long term and by first reconsidering the ways to guarantee the necessary resources. The cultural conditions are given, but the uncertainty of resources force one to think differently. Chrissie Iles: How could we compare the social and political turmoil under the various dictatorships in Latin America in the 1970s in which the works by Latin American artists (Lygia Clark, Diego Barboza, Eduardo Eielson) that form the historical cornerstone of your exhibition were produced, and the current social and political situation in Latin America and Ecuador? Jesús Fuenmayor: It is difficult to compare these moments. The hard dictatorships no longer exist in the same way, but their ghosts are still present and new forms of authoritarianism have appeared that, although new, are no less worrisome. It should also be noted that there have been important historical differences between the different scenes. The three artists you mention, for example, were producing work in very different conditions. Eielson was in Italy, Clark was in Paris, and Barboza was in London. They were part of a Latin American diasporas that began for reasons that were not always only political. None of them was disconnected from their origin and this was perceived in their works in many ways. Clark was perhaps the one who was related less literally to Brazilian identity, although her work is deeply rooted in the Brazilian avant-garde. Eielson’s departure from Peru to Europe in 1949 was a sort of inverse journey that led him to explore pre-Columbian cultures without falling into the formalisms of the ancestralists. Eielson’s most experimental work is becoming known just very recently. For Barboza it was key to be in London, where he briefly met Hélio Oiticica, and in the mid-seventies he produced some of the most innovative works that were made at that time in Latin America but he did so in the atmosphere of democratic freedom that existed in Venezuela in those years. Although I do not like to generalize, I would say that at that time making committed art, breaking with the dominant mandate of art for art’s sake, implied a greater risk in terms of an artist’s career. Nowadays it is much easier to separate good political art from the bad because, at least since the 1990s, we display an openness and a greater reception that did not exist before for this type of art. I would say that the challenge for an artist today is not so much to be accepted but to be heard. If Lygia Clark were producing her work today nobody would say that she abandoned art: her language has a contemporary currency. Today artists have more access to information and to resources that their peers from other eras lacked, but this can also be an obstacle to having their work’s discourse transcend because the homogenization of resources generates a lot of competition. In spite of the incessant political crises, nowadays in Ecuador as well as in the rest of Latin America, we experience art as an environment filled with energy and with a great future thanks to the artists and young curators who have turned away from the prevalent conservatism of local scenes. Little by little the institutions have been taken over by the new generations, thanks to which an important shift is taking place whereby institutions are no longer the ones to autocratically decide what is art and what is not. It is a change that is largely the result of figures likes Clark, Barboza, Eielson and many others who in the past insisted on changing our ways of relating to art. These are contributions that the new generations have been able to capitalize on. In Latin America it has cost us a lot to exercise the right to be avant-garde, and it is a struggle that we have been fighting since the days when Oiticica wondered if it made sense to do so in an underdeveloped country. For the new generations to be avant-garde no longer means questioning innovative aesthetic strategies that were previously considered to be of concern only to the elite of Latin America. That is a great breakthrough. Chrissie Iles: What do the street actions in the exhibition mean in the context of the recent influx of immigrants and their presence on the streets in Cuenca and other cities in Ecuador and more broadly in Latin America? 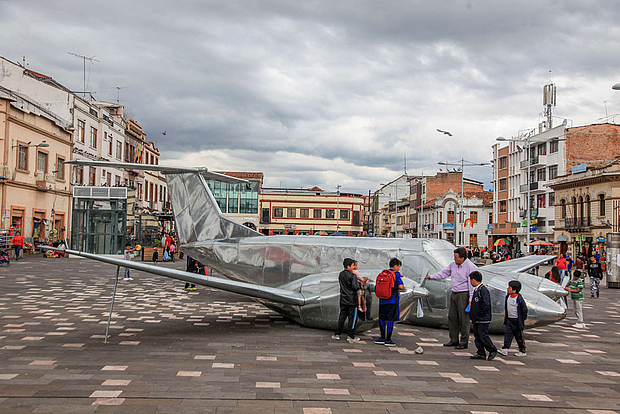 Also, how does the trans-national dialogue between Latin American artists that occurs throughout the exhibition create new readings of the city of Cuenca through their various responses to the city, its history, architecture and politics? Jesús Fuenmayor: We are talking about a very large section of the Biennial, about twenty works that are directly related to the city. The interventions in public spaces were of a different nature and may or may not be related to migratory flows, although all the artists are definitely very active in their discourse and commitments. For example, the works of Lara Almárcegui, Leyla Cárdenas and María José Machado, although they are exhibited within institutional spaces, are the direct products of working with urban space. The eight paintings by Machado (b. Ecuador, lives in Cuenca) use the smog from automotive traffic as a pigment. They were hung on a wall on the most polluted street in Cuenca for six months to create the portraits of the artisans who live there and who cannot move to other parts of the city even at the expense of their health (two of those portrayed died due smog-related causes). The work of Cárdenas (b. Colombia) is the product of her research on the contradictory ways of relating to Cuenca’s architectural heritage due to the rigidity of the regulations that generate immovable ruins, from which the artist creates an inversion that is the image of the ruin that keeps the architecture standing. Almárcegui (b. Spain), who always speaks in her work of territorial migrations, created an installation that is a mound of adobe produced from the collapse of an old house in the city’s historic center. Adrián Balseca and the duo of Arocha + Schraenen (based in Belgium) are exhibiting in spaces that have never been used to show art. 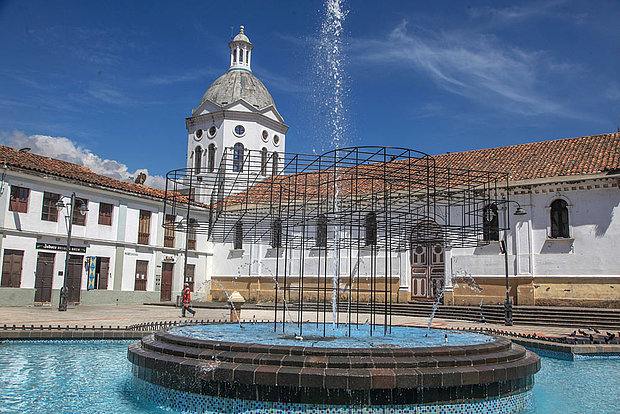 Balseca (a self-taught citizen of Quito and of the world) reactivated the headquarters of the city’s old Electric Company with a work that constituted one of the Biennial’s most complex production and installation efforts, bringing the sound of the Amazonian landscape, which in danger of extinction, to the urban context. The venue is located outside the other Biennial circuits such that the work obliges one to go through other parts of the city. To condition the space for the work the artist darkened it by blocking the windows with wooden planks so that from the outside the building seems to have been closed. 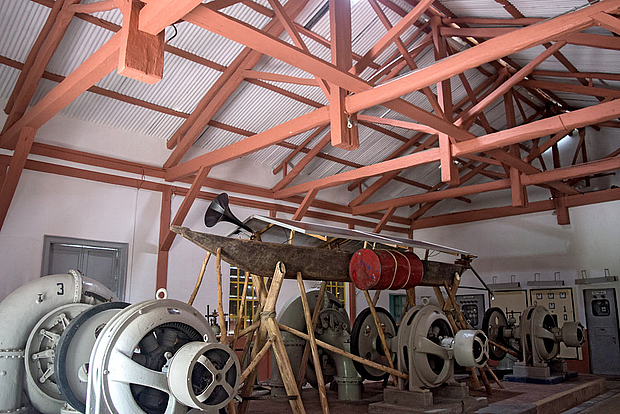 Once inside, visitors are confronted with the documentation of a trip on a raft that includes a recording of the sounds of the jungle. In the case of Arocha + Schraenen (b. Venezuela + b. Belgium), the installation was designed to be seen from both inside and outside the University Museum courtyard. The building’s façade still displays the inscription that identifies the building’s original use: Faculty of Medicine, which serves as inspiration for the work’s geometric forms that represent eye dilations that by means of the work’s reflective surface bring the outside inside of the work. There are also works that decisively inhabit the street: La caja del cachicamo (The armadillo box) by Diego Barboza, Pedazos (Pieces) by Julien Bismuth, The Airplane Fell to Earth by Finishing School, Las ruinas circulares (The circular ruins) by Matheus Rocha-Pitta, Guapondelig by Jessica Briceño, Revolver by Lipinski + Redondo, Prácticas in-formales. Patrones de color mercantil (In-formal practices. Mercantile color patterns) by David Orbea, Recorrido equinoccial (Equinoctial tour) by José Luis Macas, Gente de color (People of color) by Carlos Martiel, Totem taboo by Erick Beltrán, Voces monumentales (Monumental voices) by Ishmael Randall Weeks, and la vida continua al ritmo del corazón bajo la sombra de un beso en el momento refractario después del amor como un abrir y cerrar de ojos (life goes on at the pace of the heart beating under the shadow of a kiss in the refractory moment after love like the blink of an eye) by Santiago Reyes. The works of Reyes, Beltrán, Martiel and Barboza are simultaneously those that speak of power and have recourse to a performative language. 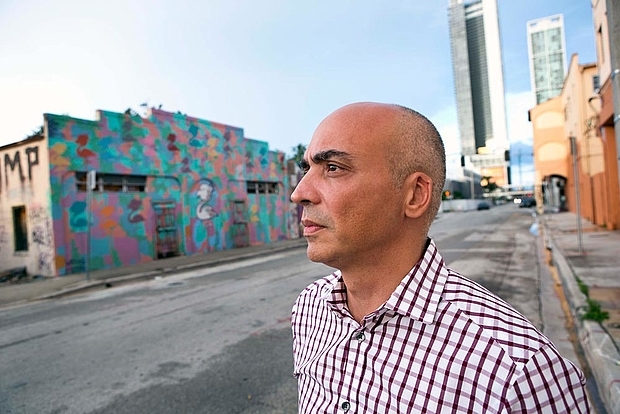 Barboza’s (b. Italy; d. Venezuela) work is a reconstruction of a 1974 piece designed as a celebration that incorporates popular music and the public’s spontaneous participation, using art as a space to generate community instead of exclusions. 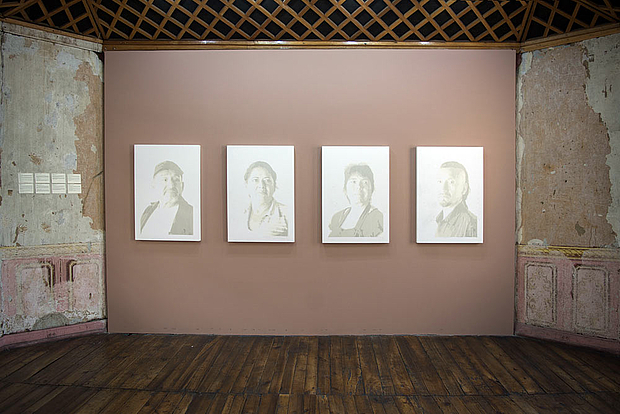 Beltran’s (b. Mexico, lives in Barcelona) work was comprised of a caravan of people with masks and banners that capture the image of the power for Cuencans and that are based on the surveys he conducted in months prior to the Biennial’s opening. Martiel (b. Cuba, living in NY) wanted to take the opportunity of his return to Ecuador as a way to create tension between his presence and censorship, in a context where Afro-descendants have been historically marginalized. In multiple performances he remained hidden inside a cement mold in the shape of a rectangular column that was placed at various locations in the city. 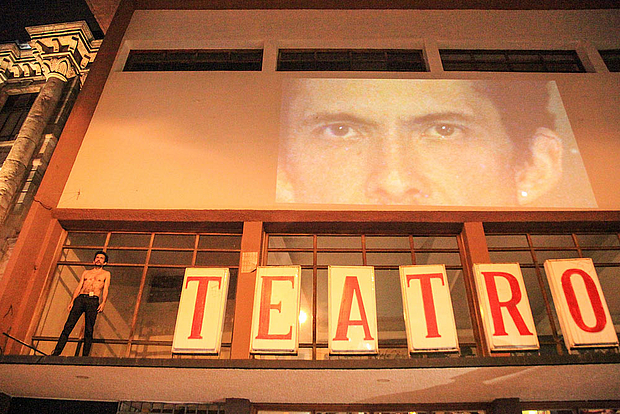 Reyes (b. Ecuador, lives in Paris) reactivated some of his historical performances, which constituted a very significant mini-retrospective of the most radical Ecuadorian performance artist. In his research, this anti-heteronormative artist, places his work in front of the mirror of art’s patriarchal authority in order to question and deconstruct it through his “tongue-in-cheek” choreographies in which he subjects his own body to situations in which he is on the verge of collapse. Bismuth (b. France, lives in NY) spent months writing the ten texts that he distributed as posters on the city walls. His initial idea was that these texts could serve as an urban script that reflected the daily life of citizens. In the end, the texts opened up possibilities that were much more literary than performative, although they are somewhat trapped in this limbo, which makes them even more interesting and more open to emotions than to thought. One of the texts could have very well been the title of the biennial: “imagina todo esto de otra manera” (imagine all this in a different way). Las ruinas circulares by artist Matheus Rocha-Pitta (b. Brazil, living in Italy) is a work comprised of a bus parked behind the Pumapungo Museum where the Pumapungo Archaeological Park is located and the most important Inca ruins outside of Peru. 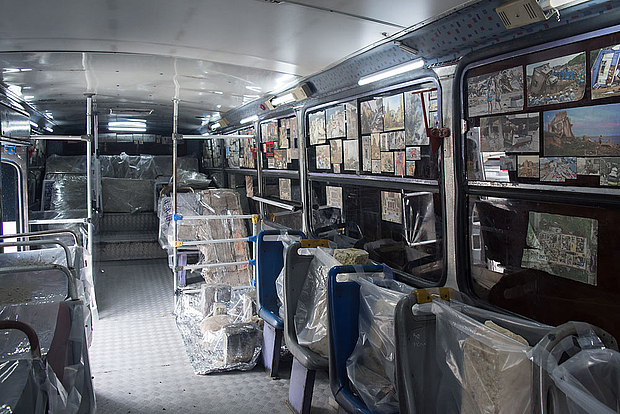 The interior of the bus has been transformed into a device for displaying hundreds of press clippings with scenes of ruins, showing remains as subversive but also ambiguous material. Another work that operates from an inventory is Guapondelig by Jessica Briceño Cisneros (b. Caracas, lives in Santiago de Chile). The title of the work derives from the name of the ancient town where Cuenca is located and that means “wide plain like the sky” in the indigenous Cañari language (the name that was changed to Tomebamba when the site was conquered by the Incas). Her series of “hydraulic architectures” consists of interventions in urban fountains. Starting with an inventory of 12 fountains that were shown as models in one of the museums, the artist produced three urban interventions that were inspired by the idea of a circular landscape implicit in the name that the Cañari gave to the city. Her interventions take the form of metallic structures that go around repeating the geometries of the fountains, covering them like an exoskeleton. Lipinski + Redondo (b. Sweden + b. Brazil, living between Stockholm and Rio de Janeiro) presented a version of their work REVOLVER, which refers to the suppression of slavery’s history. It was initially presented at Casa França Brasil, former site of the first chamber of commerce in Rio de Janeiro, and a building that turned into a glamorous center for contemporary art. 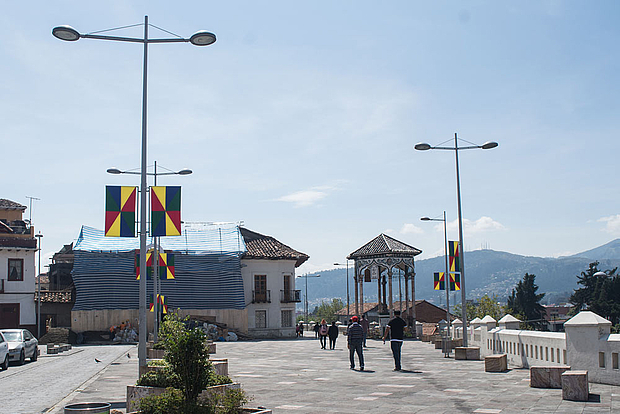 In Cuenca the work was recreated on account of its potential to stir the city’s memory. The structure was placed in the Parque de la Madre (Park of the Mother), a modern urban development that is one of the main axes connecting with the historic center. One of the city’s greatest urban transformations occurs just across from the main river, the Tomebamba: from a place of waste during the colonial period, the river has been transformed into a modern promenade that connects with the historic center. The park is located in front of the river, as is Lipinski + Redondo’s intervention, so that the new does not become a reason to forget the past. Finishing School, the Los Angeles-based collective whose members include Nadia Afghani, Matt Fisher, Ed Giardina, Jason Plapp, and Jean Robison, proposed the Biennial’s most monumental work: El avión cayó a tierra (The plane fell to the ground), a replica of the plane that Ecuadorian President Jaime Roldós Aguilera was travelling in when it mysteriously crashed in the Huairapungo mountains, in the province of Loja, on May 24, 1981. The idea started from the fact that the artists were working at a distance from a context unknown to them. From there, they decided to research and map the U.S. government’s interventions in Latin America. The fact that Cuenca is the South American city with more American “expats” (expatriates or immigrants) did not go unnoticed. Orbea (b. Ecuador, lives in Guayaquil) and Randall Weeks (b. Peru, the son of immigrants from New York, lives in Lima) are two other artists who dealt directly with the urban life of marginalized groups as represented by the city’s street vendors. In his work Prácticas In-formales (In-Formal Practices), Orbea proposed using the colors of the umbrellas used by street vendors to protect themselves from the sun and rain like the colors of a flag, symbolically empowering their presence by distributing flags throughout the city. In his Voces monumentales (Monumental voices) Randall Weeks engages a strategy that, one might say, is the reverse Orbea’s: instead of empowering the street vendors by making their presence visible in the “institutional” urban context, Randall Weeks asks visitors to approach the street vendors. To their display devices (the structures they use to sell their products or offer their services) he adds vitrines containing objects that allude to their personal histories, histories that can be heard in audio recordings of own voices. In tandem with these street displays, in one of the museums that is part of the Biennial circuit, the artist also exhibited a hybrid monument, or anti-monument, based on a replica of a pedestal in the main square and combined it with street vendors displays. Chrissie Iles: Can you articulate how your Biennial exhibition and the six parallel exhibitions relate to each other, in particular he show you curated of works from the Cisneros Fontanals Art Foundation (CIFO), which has a particularly strong synergy with your curatorial vision for this Biennial? Jesús Fuenmayor: I am interested in exhibitions that are transparent and acute due to the debates they generate and/or because they are able to shed new light on historical aspects that have not been sufficiently explored. I am not interested in exhibitions that make art speak of other things, such as in the trend of returning to iconographic shows that I thought had been surpassed thirty years ago and, to my surprise, has returned in certain curatorial practices. It may not be so obvious, but the coincidence in the use of the word “plural”—in the title of the Biennial and in the exhibition that I curated of the CIFO collection—is not accidental. The idea of reiterating the word “plural” in both exhibitions came about because the word yields connotations that can sometimes lead to erroneous meanings. In the subtitle of the Biennial, “art as a plural experience”, the intention is for the word to help us think about the variety of experiences that are presented as alternatives to traditional ways of relating to art. In the title of the CIFO exhibition, Imperios de lo plural (Plural Domains), the word ironically suggests the imposition of pluralism as an end in itself. Diversity should not come about through an imposition by the empire referenced in the title. I wanted to diversify the use of “plural” so that the public questions the way in which we use it, which can be positive or negative. The selection of CIFO works complements the Biennial in many ways: it is focused on Latin American artists of three generations (emerging, mid-career, and established); it includes representatives from different countries, and a significant female representation; it comprises works in all media, including drawing, sculpture, photography, video, installations and assemblies, without neglecting any strategy or program, as long as the works were linked in some way to the idea of diversity. It follows that there were many resonances with the selection of artists that I made for the Biennial, although for CIFO the issue of public reception (how we relate to art) was treated more on a metaphoric level. For me it was important that part of the CIFO exhibition’s function was its significance as a means to circulate a collection of contemporary Latin American art, as Ella Fontanals-Cisneros’ foundation has been doing for several years. For me the Biennial is the present, and the CIFO exhibition the future—that is, it is the duty of institutions to make art endure. 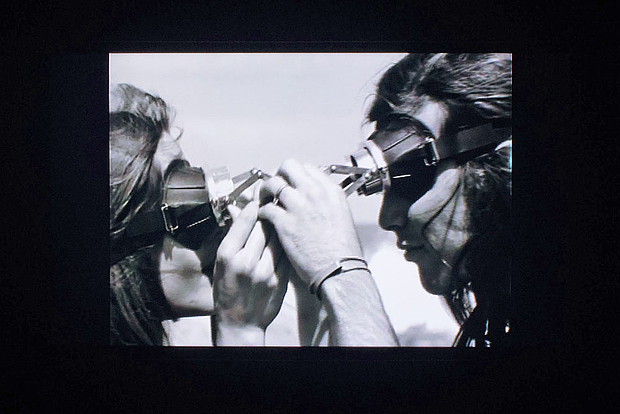 The works that were shown covered a panorama of Latin American artistic production of the last ten years. The other parallel exhibition in which I was directly involved was Legible-Visible: Entre el fotograma y la página (Legible-Visible: Between the film frame and the page) curated by Mela Dávila with the assistance of Maite Muñoz. As they themselves write in the catalog, the exhibition “aims to explore the relations of continuity, complementarity or dialectic that are established between artist publications and audiovisual works, two media that have experienced moments of intense development in the creative context in the course of the last century.” It is an exhibition that I found extremely pertinent from the start because, in addition to being a historical show that involves conceptualist practices that are little-known locally, it has the great virtue of approaching history from a different and innovative angle and through an approach to the presentation of documentary and visual material that is very generous with the public. Chrissie Iles: What inspired you to create an exhibition structured around the experience art as a living structure? Jesús Fuenmayor: Since the early nineties when I organized the exhibition Cuarta pared (Fourth wall) I overtly committed to reception in art as a central axis of my curatorial practice and my interest in contemporary production. Thanks to this exhibition (with artists José Gabriel Fernández, Félix González-Torres, Alfredo Jaar, and David Lamelas), which was presented at a museum in western Caracas, the community changed its relationship to the museum. Since then I understand my curatorial role as the link between artists and the public. 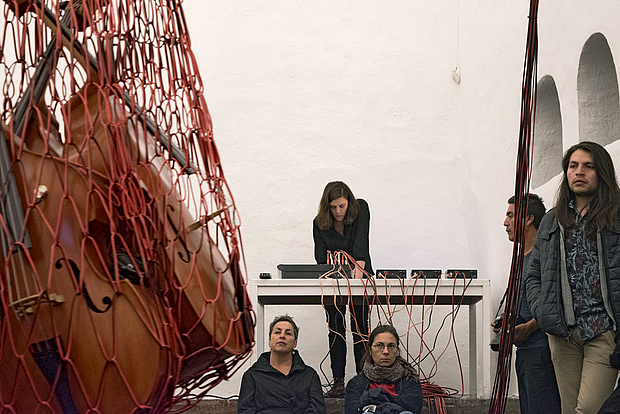 The Cuenca Biennial has been a great opportunity to think about art’s reception, and I felt a responsibility to recognize the urgency and determination in the public’s questions about art’s foundations. So for Cuenca—from the idea of taking the public’s questions seriously, avoiding biennial spectacularization, and focusing on the artists’ works—I conceived of the curatorship as an invitation to think about how we relate to art. The key for me is to recover and reinterpret the difference between the reception of art in the metropolis and in situations at the margin, such as those that prevail in Latin America. The difference can be characterized as the difference between the “will to rupture” and the “will to experiment” [experimentar in Spanish signifies both to “experiment” and “experience”]. To put it briefly, one could sum up the “will to rupture” as that which corresponds to the desire to overcome the cosmopolitan vanguards: each new movement or trend is conceived of as overcoming the previous one. This model of supersession translates into a hegemonic, linear, and historical construction that we still suffer the consequences of and that we have not left behind. On the other hand, the “will to experiment” is a horizontal model, in which what matters is not the admiration for the great masterpiece by the genius artist, as happens in the European model of supersession, but in which what matters is to experience, to live the work. This model could not have intensified the way it did except in, from, and for Latin America, initially with a generation of kinetic artists who advocated for the public’s inclusion in 1950s and 60s Paris, and then with the more radical gestures of conceptualisms of the South and a series of other works produced throughout the sub-continent, which are invitations to think critically about reception. Indeed, the Biennial’s emphasis is on experience, but on a particular type of experience. It is neither the contemplative-admiring modality nor the one implicit in the neo-colonialist idea of instilling art in the people (as a mediocre politician would do). Rather it is an experience in which we stop underestimating both the public and art. An experience that we encounter, for example, in the reference for the Biennial’s title (Living Structures), which comes precisely from a very inspiring work by Lygia Clark. As part of her propositions in the 1960s, Clark, after her “abandonment” of art, made the series of “Estructuras vivas” (Living structures). It is produced by a very simple procedure: rubber bands are joined together and build a network that, beyond its aesthetic qualities, promotes a relationship with the object that generates indescribable communities whereby the relationship between participants changes with the forms. That is great lesson of Clark’s work that I wanted to make ours for the Biennial. Jesús Fuenmayor’s responses were translated from the Spanish original.